(CBS News) Following the release of a video showing Mitt Romney characterizing supporters of President Obama as people "dependent on the government" who "believe that they are victims," several prominent conservatives this week have jumped to defend the Republican presidential candidate's remarks. Pundits on the right and Romney supporters largely said that Romney's remarks were truthful and that he would be well-served to stand by them as he faces media scrutiny. "Mitt Romney probably could have better explained himself," Rep. Allen West, R-Fla., said Tuesday on Fox News. "I think he was a little clumsy in doing it." West said that Romney was right to say the U.S. is "moving toward economic dependence instead of economic freedom." As evidence, West pointed to the increase in food stamp recipients under the Obama administration as well as poverty and unemployment rates. Romney delivered the remarks in question at a private fundraiser earlier this year. Video of the event was obtained by the left-leaning media outlets Mother Jones and the Huffington Post. "There are 47 percent of the people who will vote for the president no matter what," Romney is heard saying in the video. "All right, there are 47 percent who are with him, who are dependent upon government, who believe that they are victims, who believe the government has a responsibility to care for them, who believe that they are entitled to health care, to food, to housing, to you name it. That, that's an entitlement. And the government should give it to them. And they will vote for this president no matter what." Romney on Monday did not apologize for the remarks but said they were "not elegantly stated" and that he was "speaking off the cuff." Some moderate conservatives and libertarian commentators -- and at least one prominent conservative -- chastised the GOP candidate. Conservative commentator Bill Kristol called Romney's remarks "stupid and arrogant." "It's worth recalling that a good chunk of the 47 percent who don't pay income taxes are Romney supporters--especially of course seniors (who might well 'believe they are entitled to heath care,' a position Romney agrees with), as well as many lower-income Americans (including men and women serving in the military) who think conservative policies are better for the country even if they're not getting a tax cut under the Romney plan," he wrote. "So Romney seems to have contempt not just for the Democrats who oppose him, but for tens of millions who intend to vote for him." New York Times columnist David Brooks called Romney's economic vision "a country-club fantasy." "It's what self-satisfied millionaires say to each other. It reinforces every negative view people have about Romney," he wrote. "Personally, I think he's a kind, decent man who says stupid things because he is pretending to be something he is not - some sort of cartoonish government-hater. But it scarcely matters. He's running a depressingly inept presidential campaign. Mr. Romney, your entitlement reform ideas are essential, but when will the incompetence stop?" Matt Welch at the libertarian magazine Reason wrote that Romney's characterization of the "47 percent" is "economic determinism at its worst" and goes against the core conservative belief in the chance for upward economic mobility. "What the 53/47 dividing line says... is that income status is a permanent political condition, defrocking all Americans of agency and independent thought," Welch wrote. Welch concludes, "But the reason this controversy will have legs is ultimately because many Republicans think Romney's comments were just fine. They are about to learn what the rest of the country thinks about that." 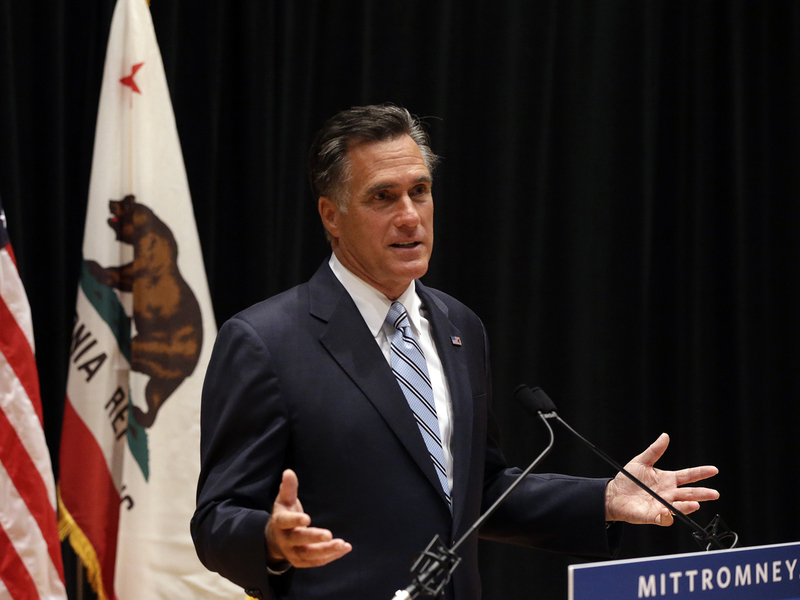 Many conservative commentators did defend Romney's comments, for various reasons. On Fox News Tuesday, conservative radio host Laura Ingraham argued that Romney was simply making the point that there's a large segment of the electorate that will surely vote for President Obama. "That there is a small slice of the electorate that is undecided," she said. "That's basically what he said there... I think it's ridiculous that people are seizing on it and that we're even giving all that much airtime to it, frankly." Pressed further on how Romney can defend his remarks, Ingraham said, "He has to hammer home the fact that my policies... what I'm going to do when I'm president... is I'm going to lift all the boats... Don't resent rich people, become a rich person." Jonah Goldberg at the National Review argued that "lots of people, most importantly lots of independents, understand the basic and irrefutable point that there are too many people who feel entitled to consume a lot more tax dollars than they contribute." Republican consultant Rick Davis said on "CBS This Morning" that the release of this video was bad news for the Romney campaign but that the candidate could use this moment as an opportunity to excite voters. "Now he is going to have to take a step back a little bit and say the reason I have these views about my economic plan is because of who I am. He's going to have to double up that message a little bit," Davis said. Erick Erickson of RedState.com similarly wrote that the Romney campaign should "double down" on the remarks. "The trouble for the left and media (but I repeat myself) is that most Americans agree with Mitt Romney," he said. "Most Americans consider themselves part of the 53 percent and it is not a winning proposition for Barack Obama to convince Americans they are less than they think they are when most Americans already recognize he has made them less than they were." It's worth noting that the characterization of the "47 percent" who don't pay taxes is misleading. This figure only covers federal income taxes and ignores the substantial amounts households pay in other federal taxes, like the payroll tax. The remaining taxpayers who pay neither federal income tax nor payroll taxes are typically elderly, disabled or students. Still, as Erickson points out, most Americans think the government is too involved in things that should be left to individuals or businesses. Michael Walsh at the National Review also urged Romney to stand by his remarks. "Romney sounded remarkably like... a real conservative," he wrote. "He ought to own it." He continued, "What he ought to do is step up and embrace the basic division in our nation, including the fact that nearly half the country pays no income taxes. Acknowledge it -- and then explain why, morally, this is not a good thing...Will Romney rise to the occasion and fight? Or will he retreat? Only one path can lead to victory in November."